Here’s my second noofing of 2012, hurrah! 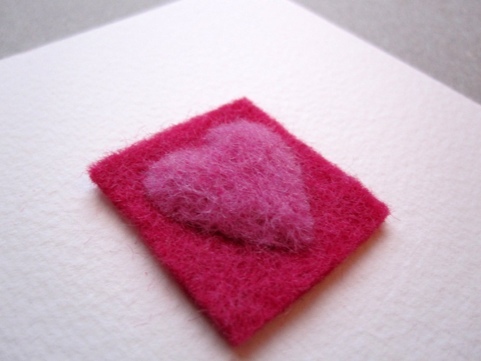 It’s a Valentine’s card, with a simple, needle-felted heart design mounted on yummy Bockingford watercolour paper. 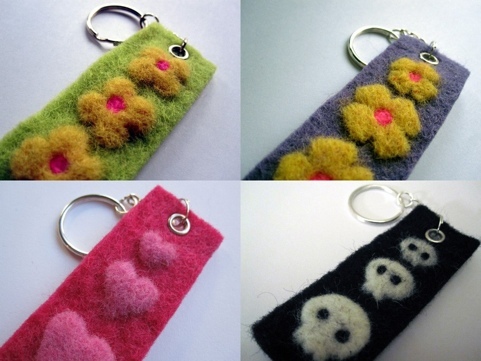 I’m going to be offering cards to match my other keyrings too soon – I have four designs so far, with more on the way! Here’s my Valentine’s card in my Etsy shop. Right, now I’m off for a relaxing soaky bath – I had a bit of a fight with my printer earlier so need to chill out! I mean my computer printer, not the little man who does my printing, I don’t have one of those. Well, unless you include Moo, but I’ve no reason to pick a fight with them! Which reminds me of being reminded of something last night. We were watching Top of The Pops, and Hot Chocolate came on singing ‘I believe in miracles’, which reminded me that when I was little I thought he was singing ‘I believe in milko’, and that reminded me that we’d run out of milk and as it was nearly midnight, all the shops were shut. Bah! This entry was posted in waffle and tagged handmade, milk, miracles, Valentine by stupidcats. Bookmark the permalink. 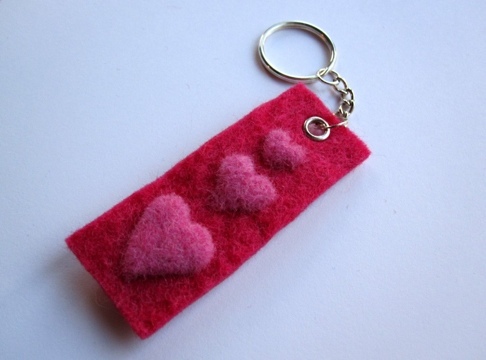 I love your key rings! I have one of my own….. It was a struggle getting up this morning and having to venture out to the shop without a coffee fix, I can tell you!